« Going “GREEN” Save the World one cup at a time. The Second World War (abbreviated WWII) was a global military conflict lasting from 1939 to 1945 which involved most of the world’s nations, including all great powers, organised into two opposing military alliances: the Allies and the Axis. It was the most widespread war in history, with more than 100 million military personnel mobilised. In a state of “total war,” the majority participants placed their entire economic, industrial and scientific capabilities towards the war effort erasing the distinction between civilian and military resources. This war was marked by significant acts against civilians, the Holocaust and Nuclear bombs. It was the deadliest conflict in human history with over seventy million casualties. The start of the war is generally believed to be September 1, 1939, when Nazi Germany invaded Poland. Most European countries such as France and the British declared war on Nazi Germany at that time. Those that were not involved in war eventually joined the coalition in response to events of aggression against them such as the German invasion of Russia and the Japanese attack on the U.S. Pacific Fleet at Pearl Harbor and on British colonies that triggered war on Japan by the United States, Britain and the Netherlands. The war ended in 1945 in an Allied victory and a changed world. The United Nations was established to enhance cooperation among nations and at the same time the U.S. and Russia (two Super Powers) entered into a “cold war” that lasted for the next 46 years. Throughout this period of time Western Europe moved towards economic recovery and only recently in history has the world moved towards political integration opening up international business and foreign trade for average American citizens like you and I.
I have had many questions as to the authenticity of this flag. 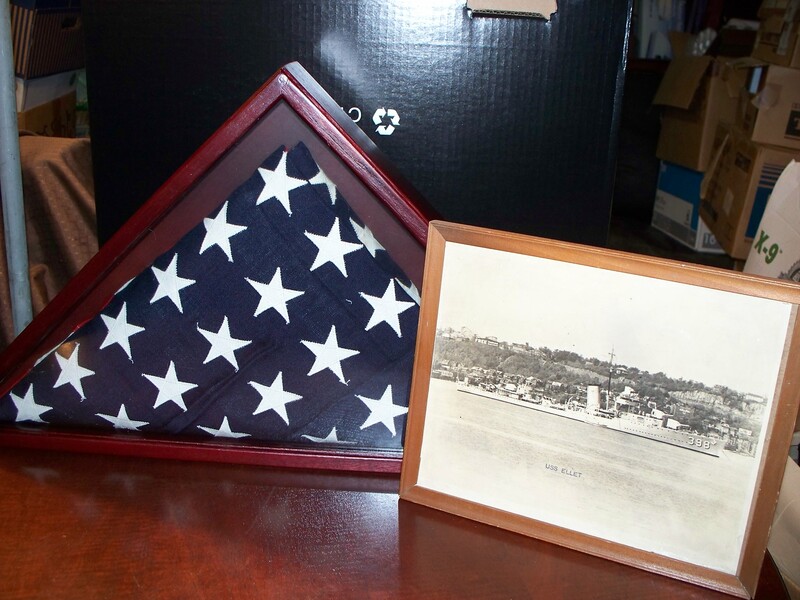 The flag belonged to my father who served on the USS Ellet in WW II and was given the flag by the ship’s Captain. Also, doing my research I found that the size of the flag is important. 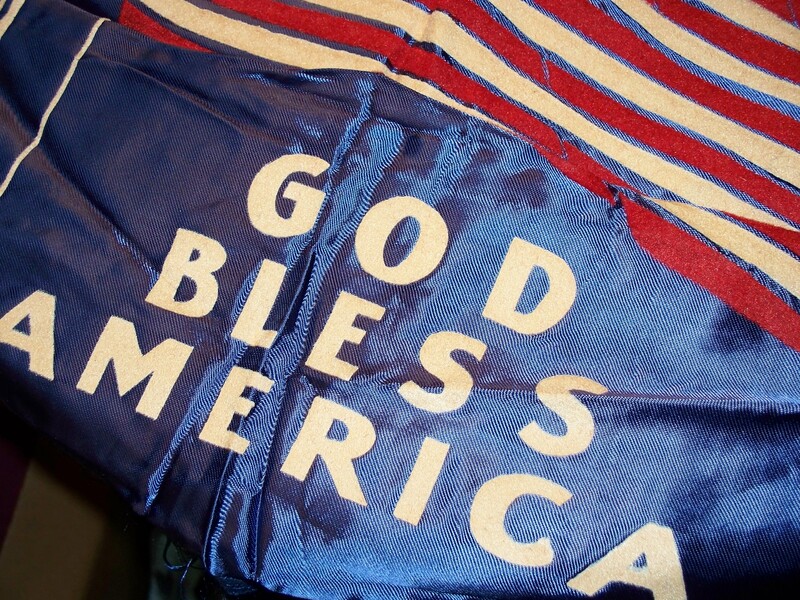 The flag is 29″ x 57″. 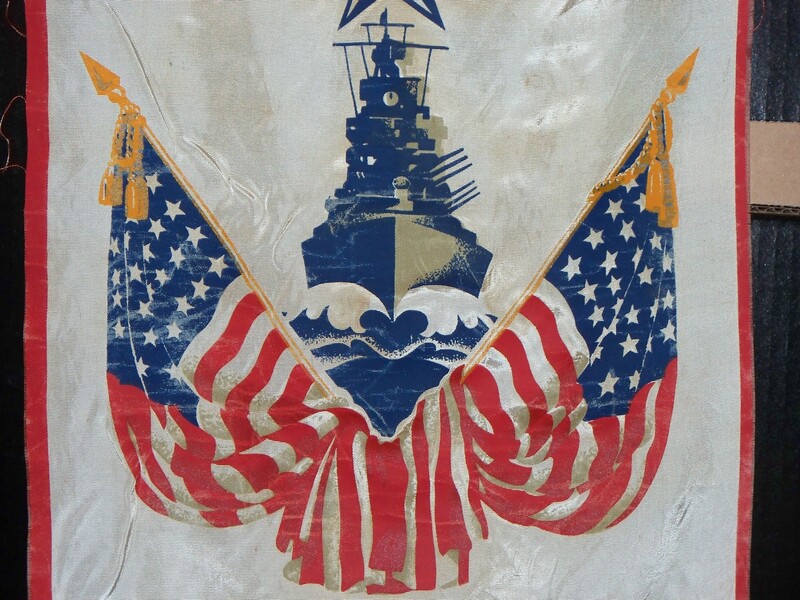 Many of the commercial civilain flags sold during this period would have been too large to fly on a ship and not sturdy enough to endure the weather at sea. 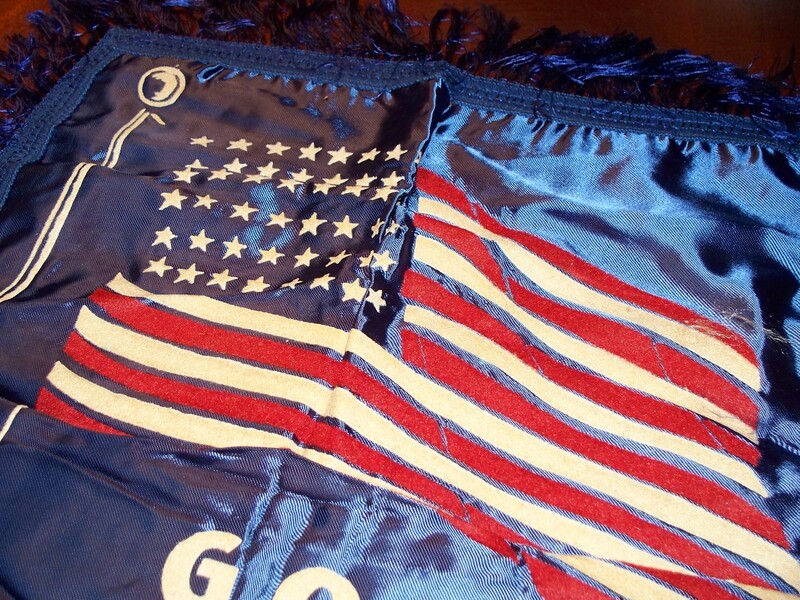 Also the number of grommets on the flag are important. 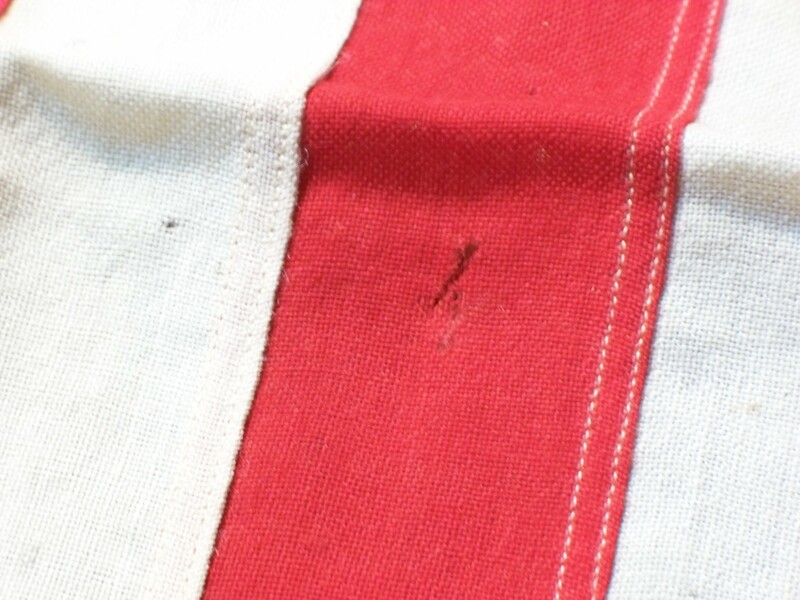 Many of the civilian commercially sold flags of the period have two grommets or none. 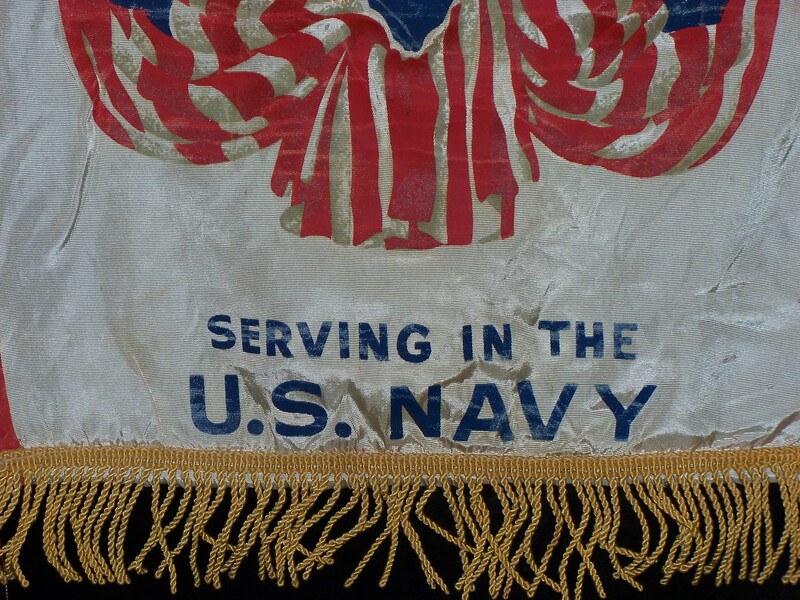 This authentic Navy flag has four grommets. 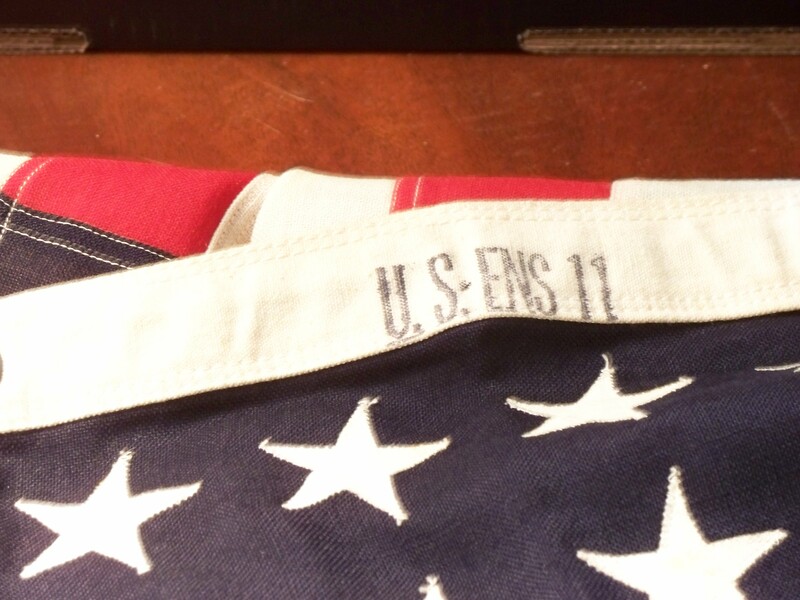 The clincher is that this flag is clearly stamped U.S. ENS – 11. This is a Naval quartermaster issue number. If you still don’t believe then do your own research. 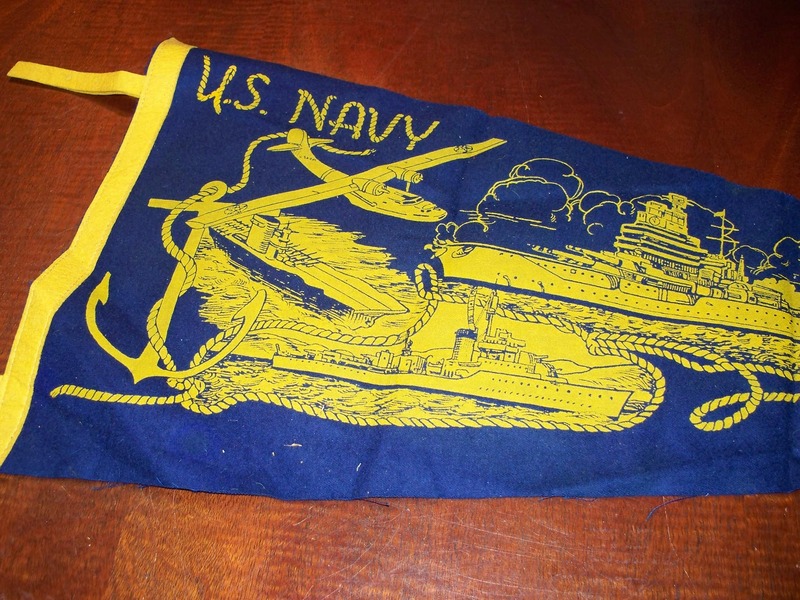 Find out what size and kind of flags were issued to Naval ships in WWII, they were standard issue. It’s not that hard. In addition to that I have my father’s DD 214 which documents his service as well as my grandfather’s Army discharge paperwork from WW I, as a machinegunner, my brother’s DD 214 documenting his Vietnam service as a comabt engineer and my own DD 214 and many documets showing that I served faithfully as an Army Combat Medic for 23 years. 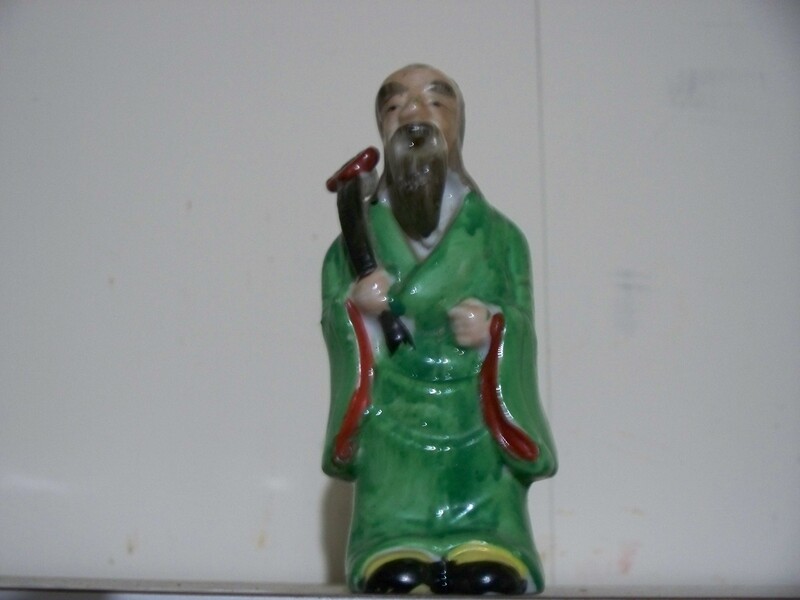 I retired in 1994. 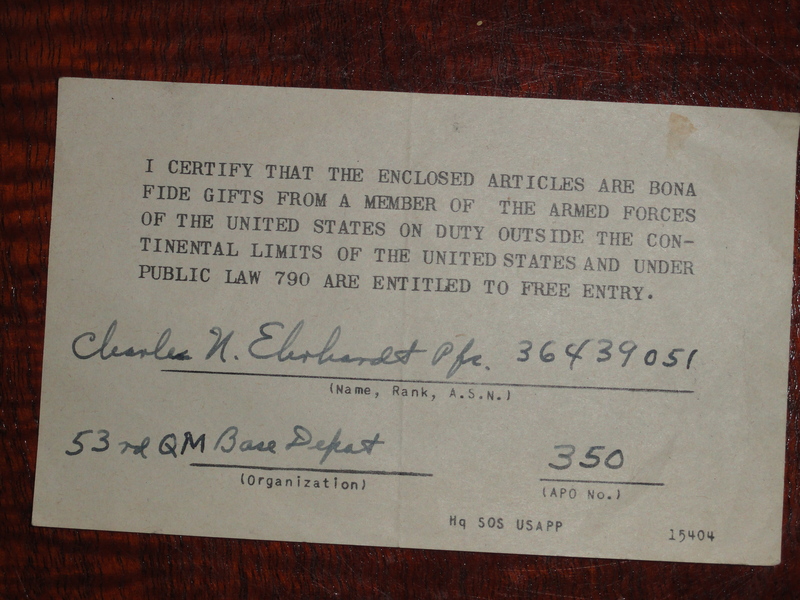 My family has a history of military service and it is documented. 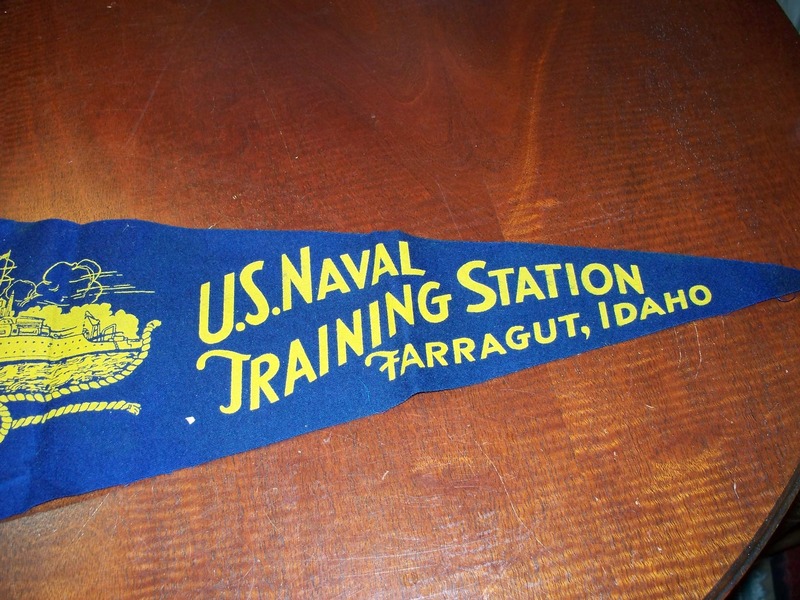 A naval Training Unit ca. 1941. 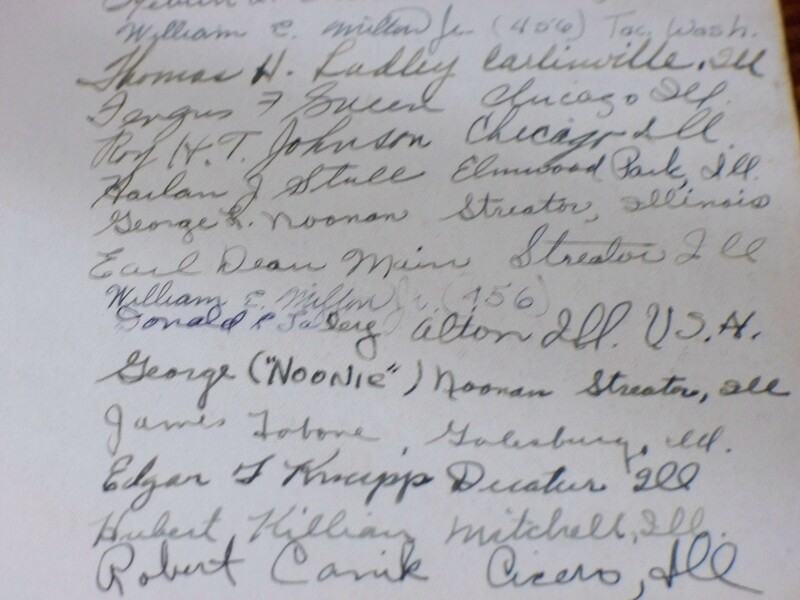 Every man signed the back and where they were from. 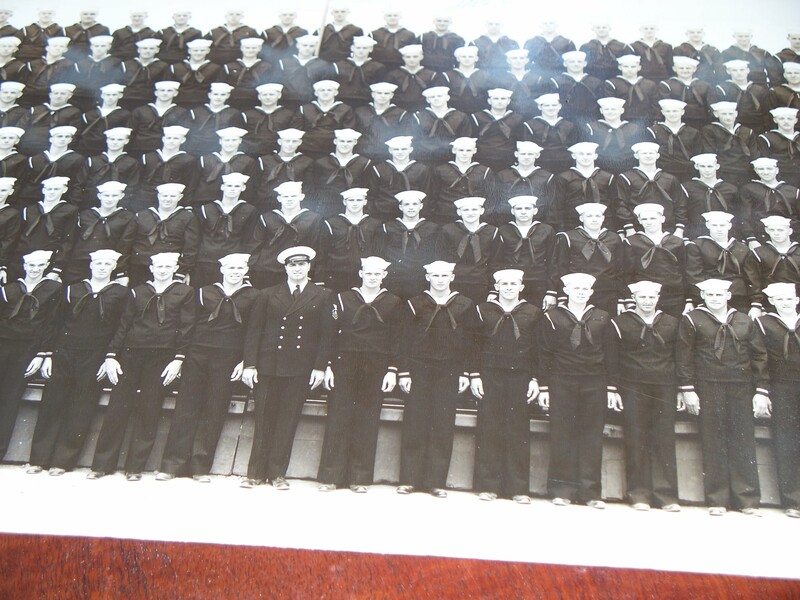 All were participants of WW II. WW II Songbook for Soldiers and Sailors and song sheet pamphlet. Official Issue. 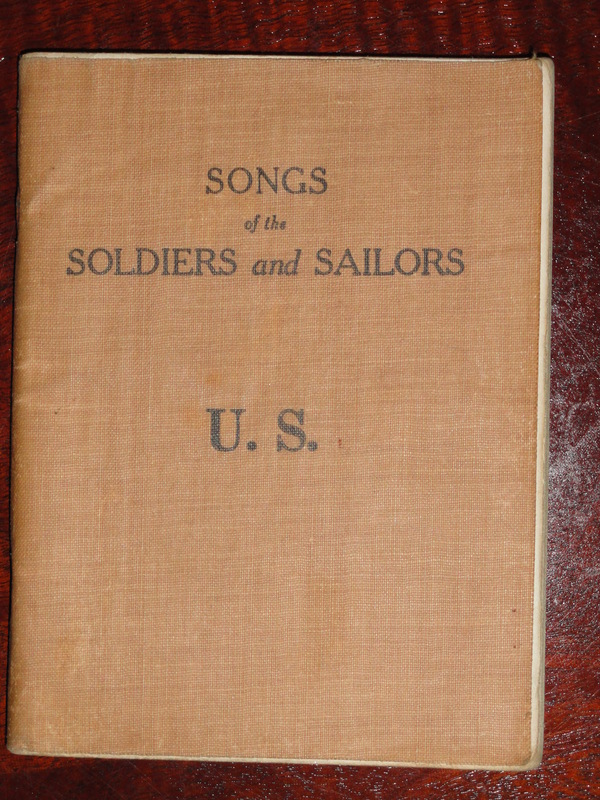 The first photo is of a U. S. WW II Songbook “Songs of the Soldiers and Sailors”. Has some nice WW II photos in it and of course many military songs of the period. 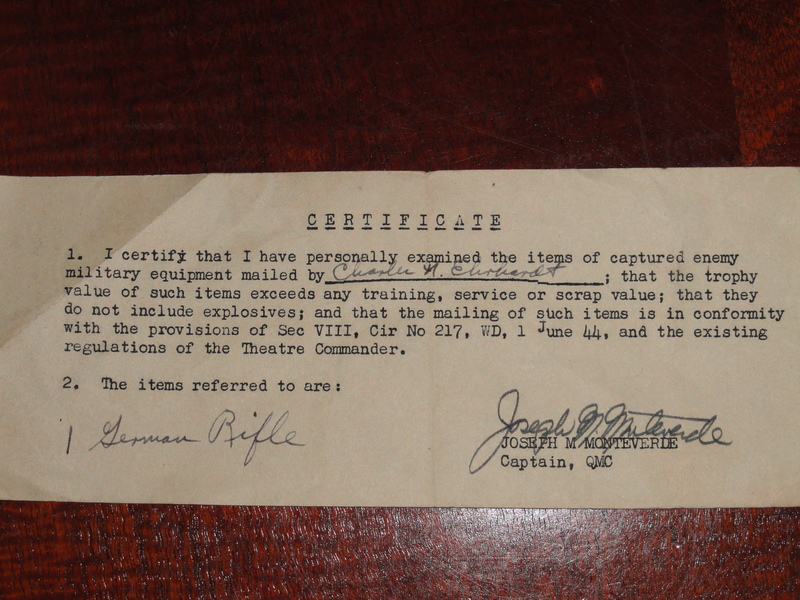 This was an official U.S. issued item for new recruits and was issued at Camp Zachary to a Pvt. Clarence H. Call. Pvt. 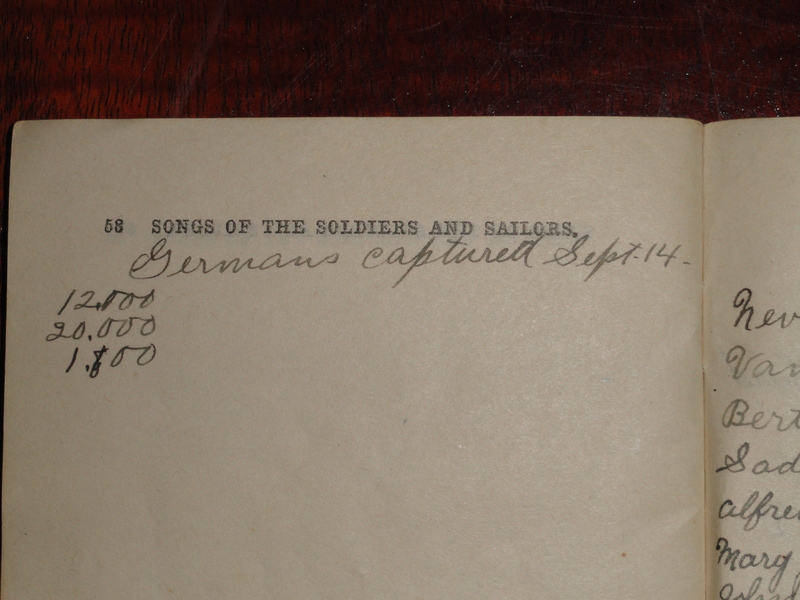 Call made a notation in the song book, “Germans captured Sept. 14th.” The copyright is the Washington Government Printing Office 1917, Patent applied for. 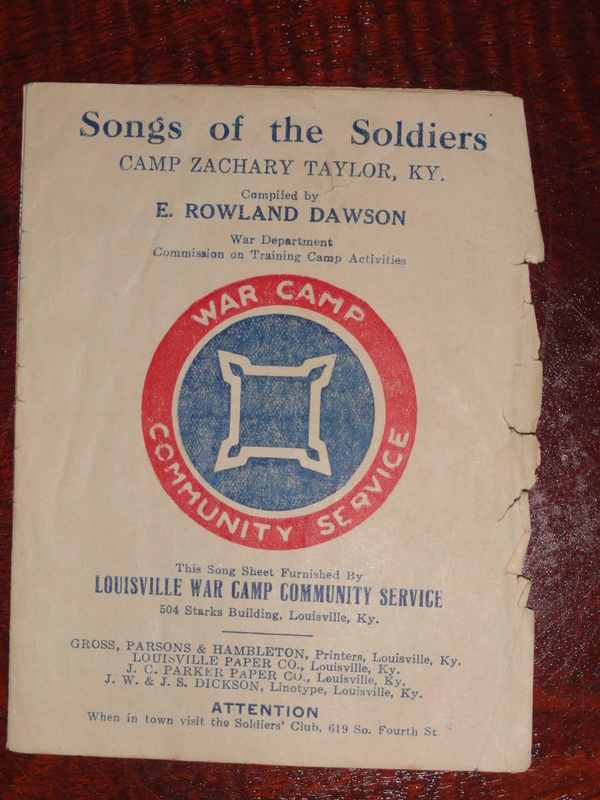 Also shown is a song sheet pamphlet given recruits by the Louisville War Camp Community Service, Louisville, KY. This pamphlet was compiled by E. Rowland Dawson, War Department Commission on Traininig Camp Activities. 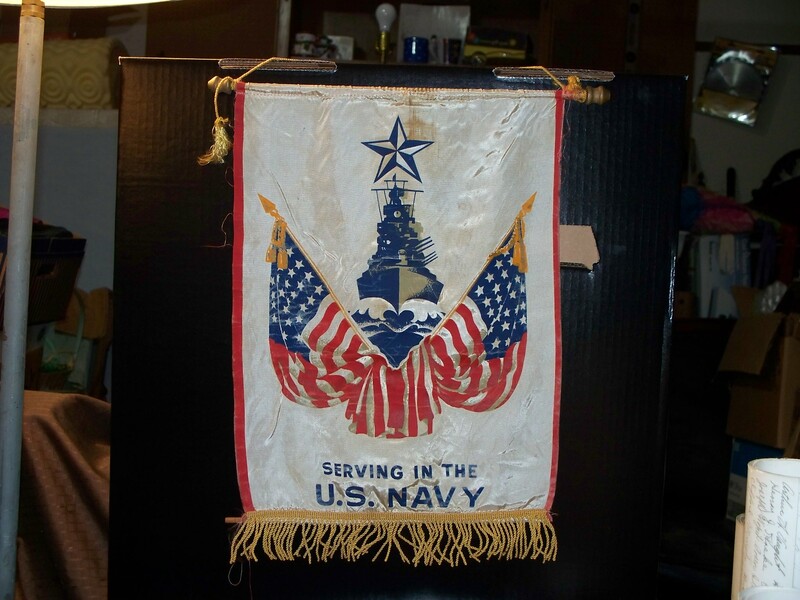 Shown above is a window banner that Momma’s put in the front picture window of their home proudly showing their support for their boys faithful service during WW II. 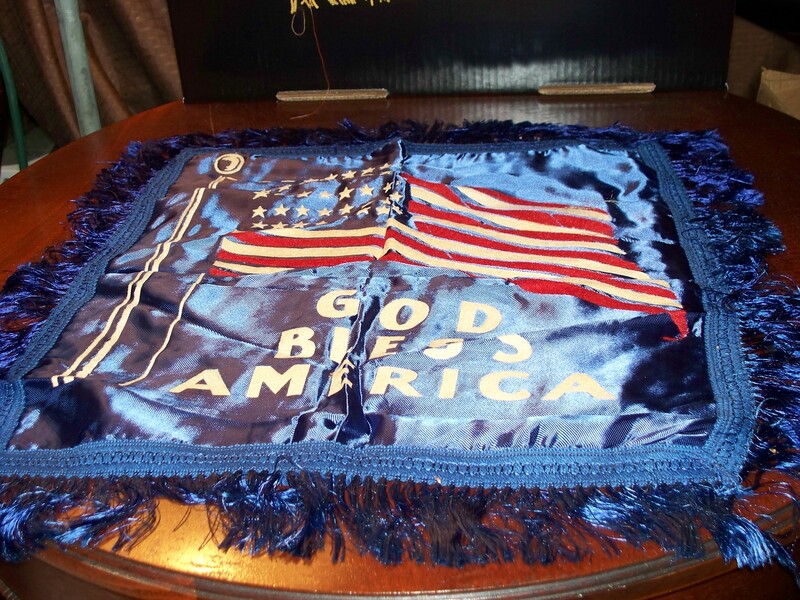 Fancy pillow cover, WW II, Red, White and Blue, “God Bless America”. 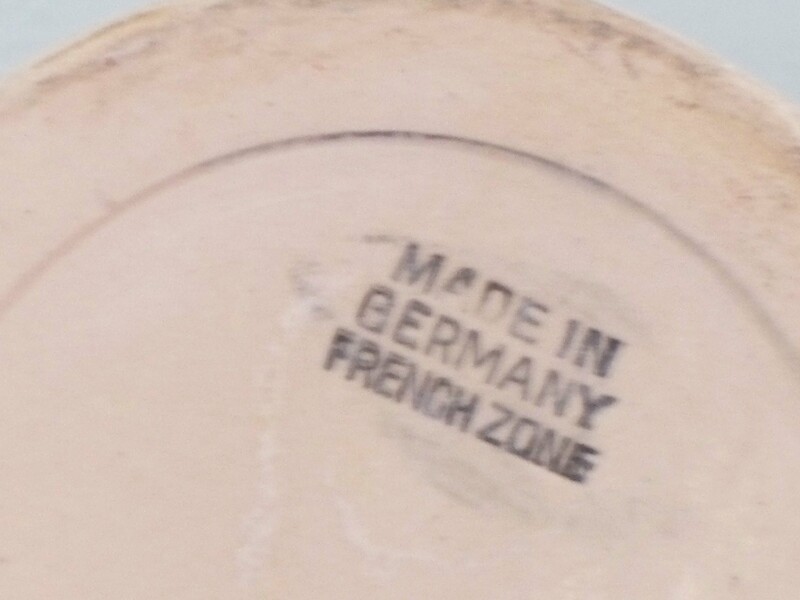 A beer Stein made in the WW II French Zone immediately after the War. 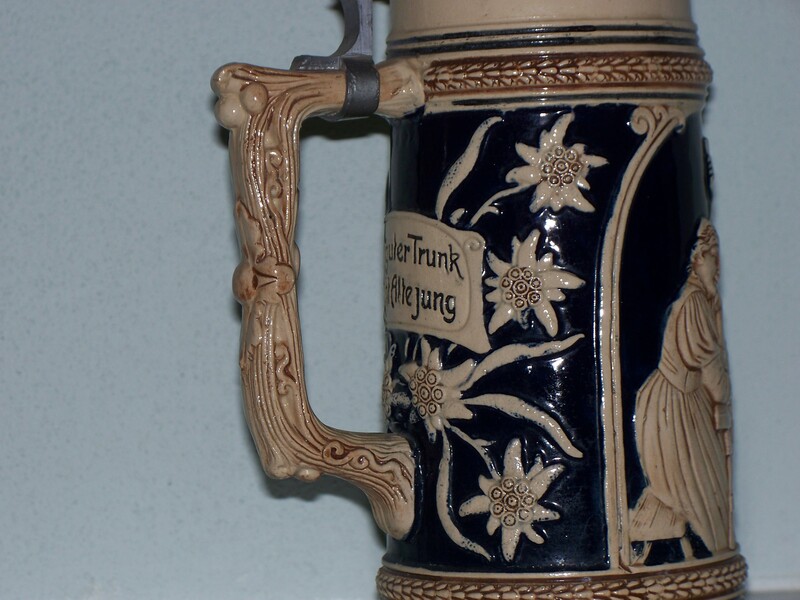 WWII collectibles are not hard to find and are an eclectic group of items. 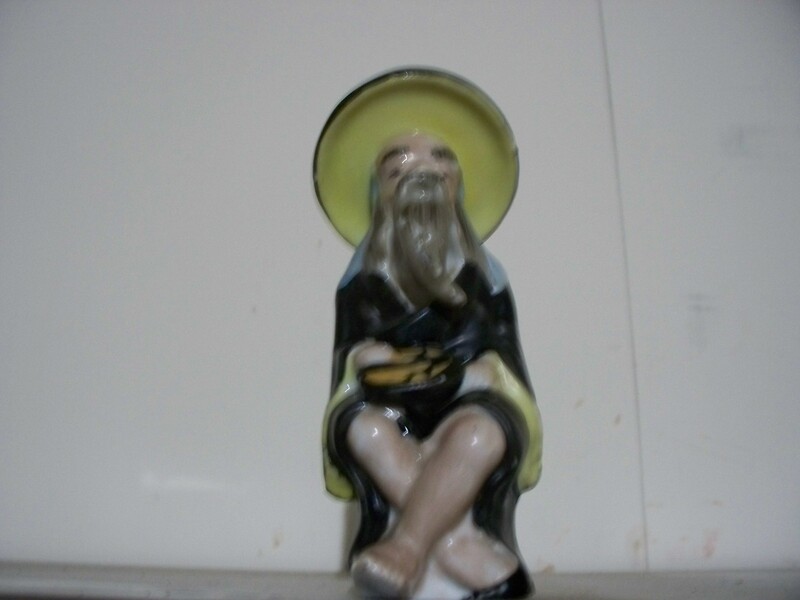 For instance I used to have an ashtray shaped into a bomber that was made from brass shell casings. 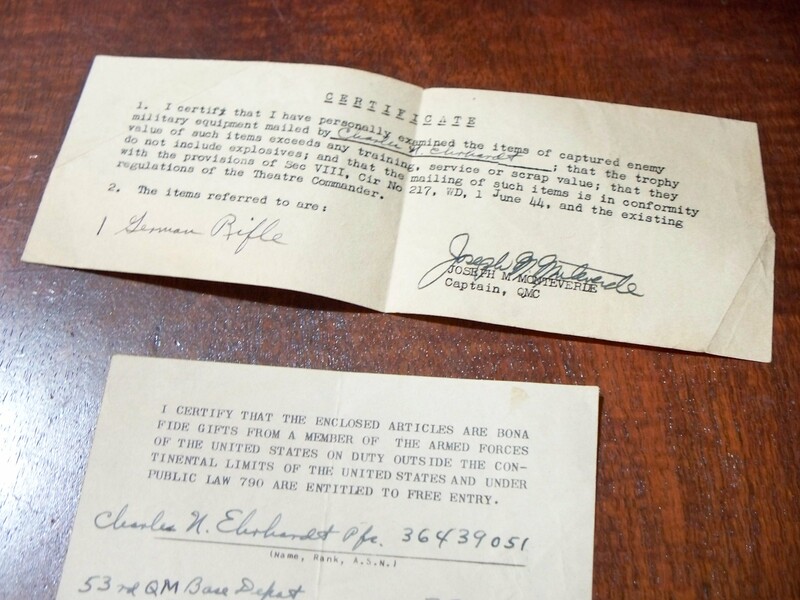 Start looking for those interesting WWII collectibles it is a great period to collect for. 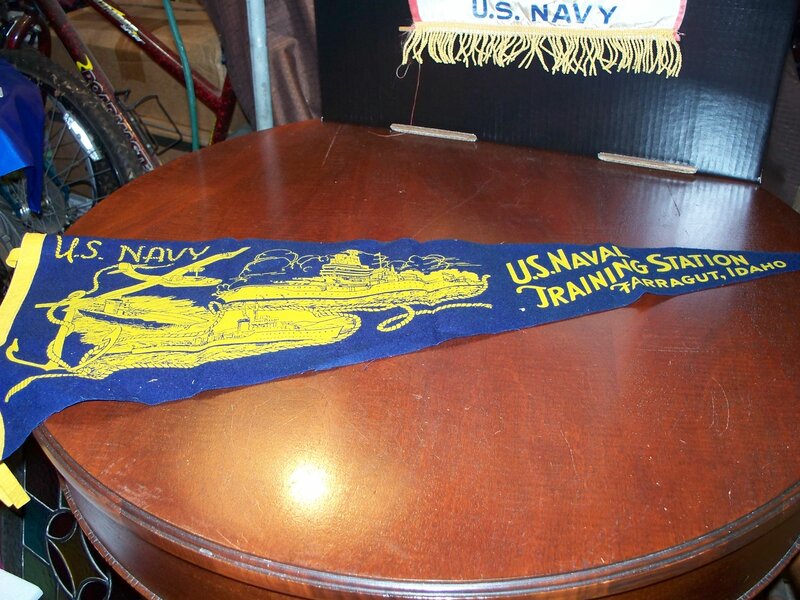 Visit my store on eBay to see more WWII artifacts or check out my booth at Bonanzle. URL is listed in Blogroll at the right.